This switched satin silver wall light with white shade incorporating a flexi arm LED reading lamp is a beautiful piece of design. 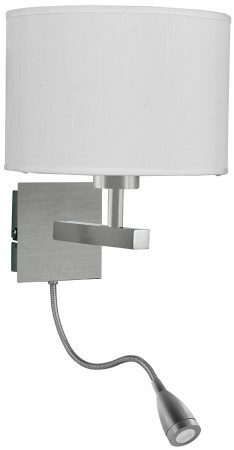 The stylish fitting has a satin silver wall plate, right angled arm and a white drum shade, with a light controlled by a handy rocker switch. It also has an innovative flexi-arm torch that uses the latest energy saving LED technology to shine the light wherever you please. Energy saving mother and child wall light in a satin silver finish, complete with matching circular shade and flexible LED reading light. This energy saving light can be used as a wall light, reading light and picture light.